Donkey Day - 6/15 - Old McDonald's Farm, Inc.
Each season, we at Old McDonald’s Farm, Inc. (a non-profit, children’s charity), offer Saturday One-Day Workshops. They are different each year. These programs offer a variety of topics that are of interest to “our kids” and are equally good for first-timers as well as alumni students that want to brush up on the topics. Either way, come learn at and enjoy our Farm Program and see all our “educators,” our Farm Program animals. We look forward to you joining us! 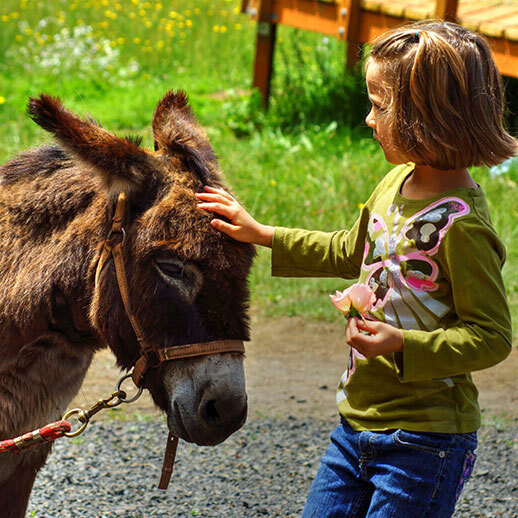 Join Old McDonald’s Farm, Inc. (a non-profit, children’s program) for a one-day, Donkey Day. Donkeys are Equines, but they ARE NOT horses or ponies! They are a very different breed, indeed. Learn all about what they are and what they are not, how to care for them and meet and enjoy our donkeys. It will be a day full of donkeys…come learn all about them! Please bring a sack lunch. For kids in 3rd grade and up. 9:00-3:30, Bus times are 8:30 and 4:00. Meet the bus at 15th/Irving NE. For 14 students max. $89 per student and $14 for the bus. Thank you to the kind folks at Concorde Career College for this! Please find directions here. Please note that due to limited staff at these Saturday One-Day Workshops, if a parent is late at the bus stop or we have trouble, we may be late to OMF, Inc. in Corbett. Please be patient, we are coming. Thanks.